A final alignment has been selected for the 3.2-mile (4.8km) long 10’-12’ diameter Kaneohe-Kailua tunnel, under Oneawa Hills, in Oahu, Hawaii. The project, which is currently under preliminary design by Wilson Okamoto Corporation (scheduled for 60% completion in late August), is thc Kaneohe-Kailua Sewer Tunnel project, which will be constructed by the City and County of Honolulu. 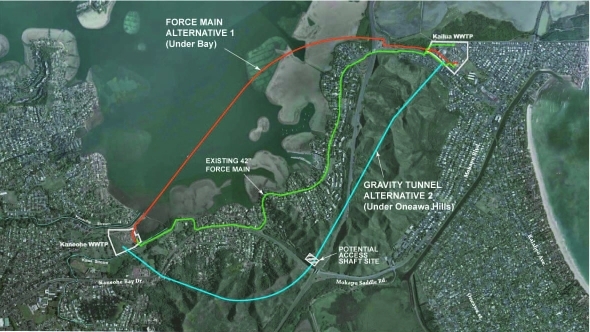 The tunnel will replace an existing 42-inch diameter force main presently conveying wastewater from the Kaneohe Wastewater Pre-Treatment Facility (WWPTF) to the Kailua Regional Wastewater Treatment Plant (WWTP) beneath Kaneohe Bay Drive. Tunnel construction will be staged from the Kailua Regional WWTP and involve the use of a hard rock TBM. Access and retrieval points for the TBM will be at vertical shafts at either end of the tunnel, with controlled blasting required for construction of the shaft and initial start-up portion of the tunnel at the Kailua Regional WWTP. Approximately 95% of the route will be excavated through basaltic rock, therefore bolts, wire mesh and steel bands will be used, as necessary, to achieve structural stability for the majority of the tunnel prior to the installation of fiberglass pipe that will result in a finished interior diameter of 10’- 12’. The annular space will be backfilled with grout. As the finished tunnel will convey wastewater by gravity flow, it will be inclined throughout its length toward the Kailua Regional WWTP – starting at a depth of approximately 44 ft below ground level at the Kaneohe WWPTF and ending at a depth of 75 ft below ground level at the Kailua Regional WWTP. A new influent pump station (IPS) will lift the wastewater from the vertical shaft to the surface for treatment. Construction of the new influent pump station will fall under a subsequent construction contract. Tunnel design is anticipated to be complete by the spring of 2013, with the City and County of Honolulu advertisement and bidder’s pre-qualification process to commence shortly thereafter.